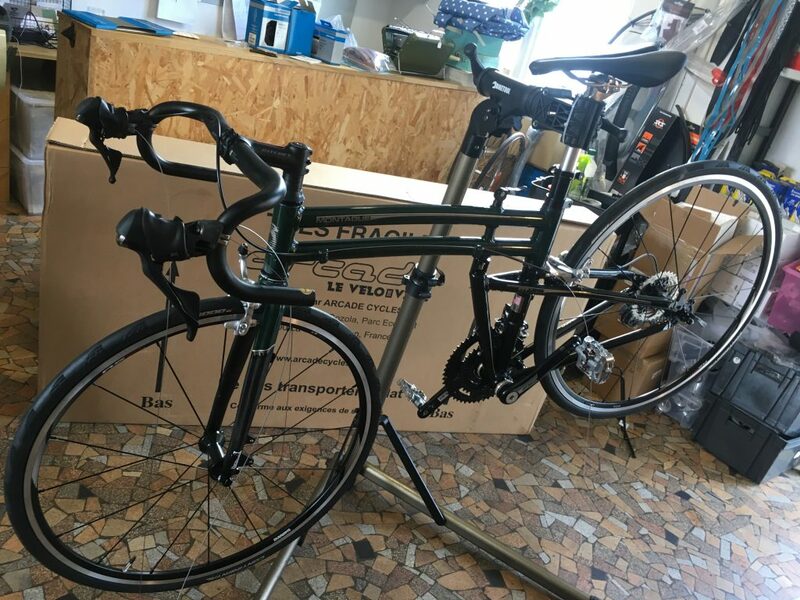 I wanted to build a lightweight, full-size folding road bike for road touring and off road excursions (gravel paths). After some on-line research I decided that the Montague Custom FIT Frame would fit my needs. 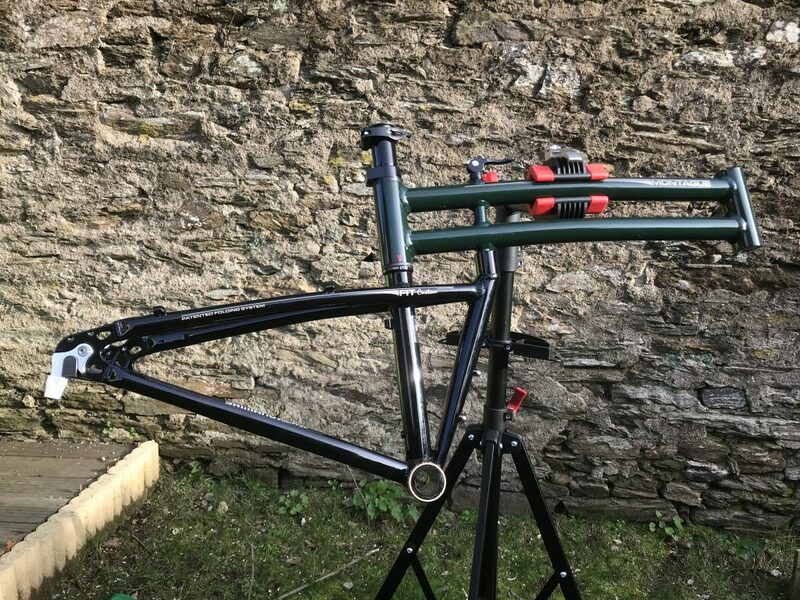 Unfortunately, since 2015 Montague have stopped selling their Custom FIT Frames, and only sell pre-assembled folding bikes. 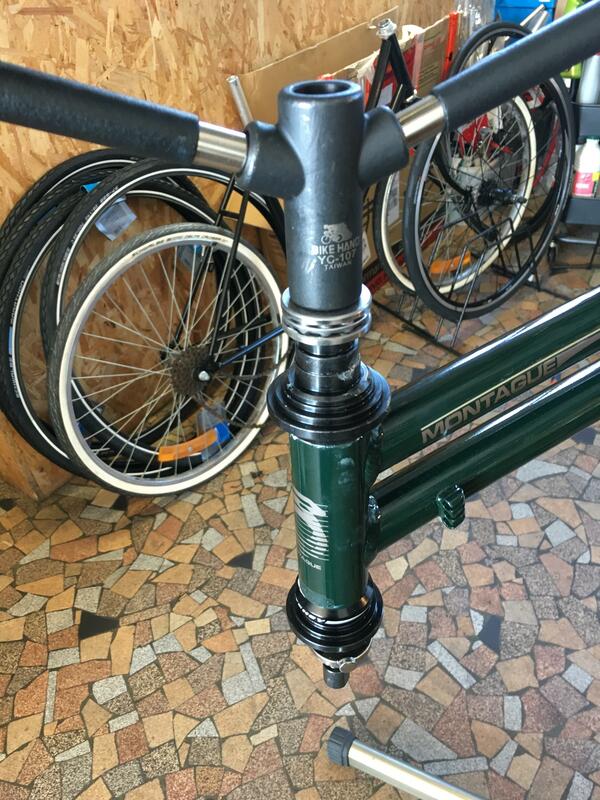 I was lucky enough to source a 2015 Custom FIT Frame from the Montague distributor in Germany. 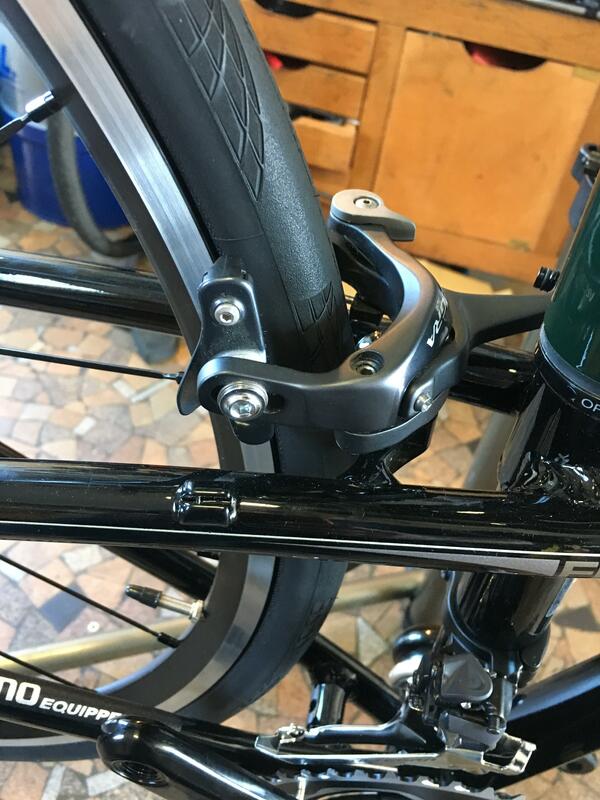 The Montague Customer FIT Frame is designed to use standard bicycle parts, and has fixations to accommodate both single pivot side-pull caliper rim brakes or disk brakes. The overlocknut distance (O.L.D) for the rear wheel dropout is 135mm. Compared to traditional road bikes that have an O.L.D of 130mm and only supporting single pivot side-pull caliper rim brakes, the extra 5mm allows the support of disk brakes. With a combination of the frame geometry and use of disk brakes, the Montague Customer FIT Frame allows the use of 32mm tires. 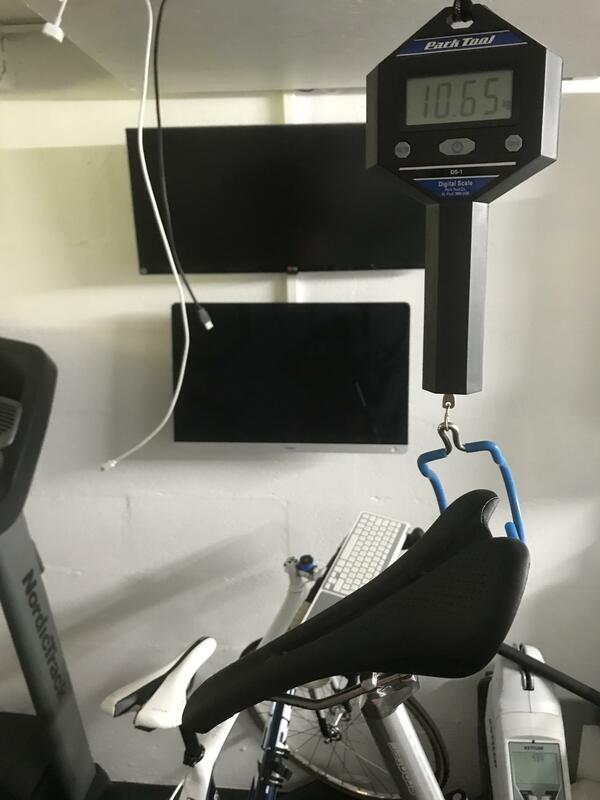 My 2013 Trek Madone 4.7 now permanently remains stationary on my Tacx Neo home trainer in my garage. So to reduce the build cost, I used the Ultegra 6700 rim brakes from my 2013 Trek Madone 4.7. I originally planned to use the Bontrager Race Tubeless Ready wheels from my 2013 Trek Madone 4.7, and change the rear axle to support the 135mm O.L.D rear wheel dropout of the Montague Custom FIT frame. However, Bontrager Race Tubeless Ready wheels require costly proprietary tools to change their axles. So I put the Bontrager Race Tubeless Ready wheels on my 2017 Team Machine SLR02, and transferred the Shimano RS21 wheelset from the 2017 Team Machine SLR02 to the Montague Custom FIT Frame ! The table below summarizes the parts used, along with their ‘spec sheet’ mass. The 2015 Montague Custom FIT Frame is a real beauty (see image below). It has a classic look with gloss black at the rear and gloss green at the front. 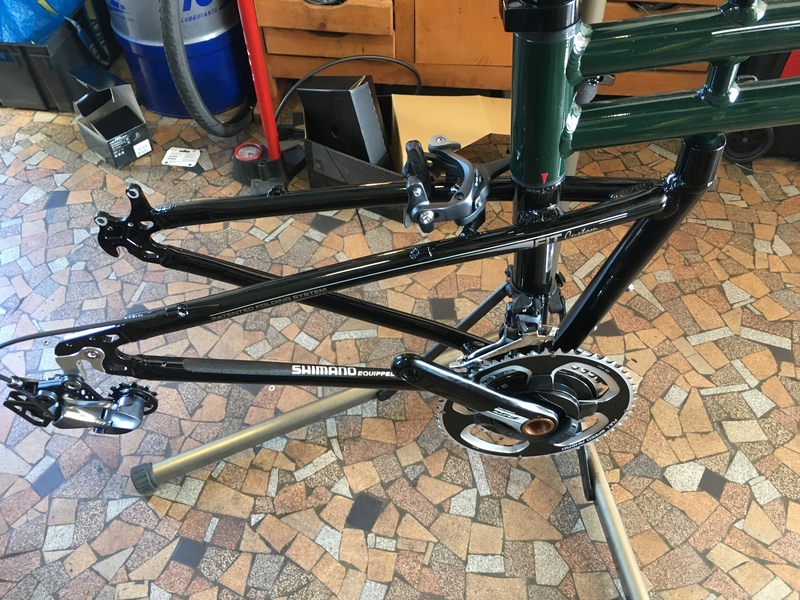 Bare 2015 Montague Custom FIT Frame – ready to be equipped ! 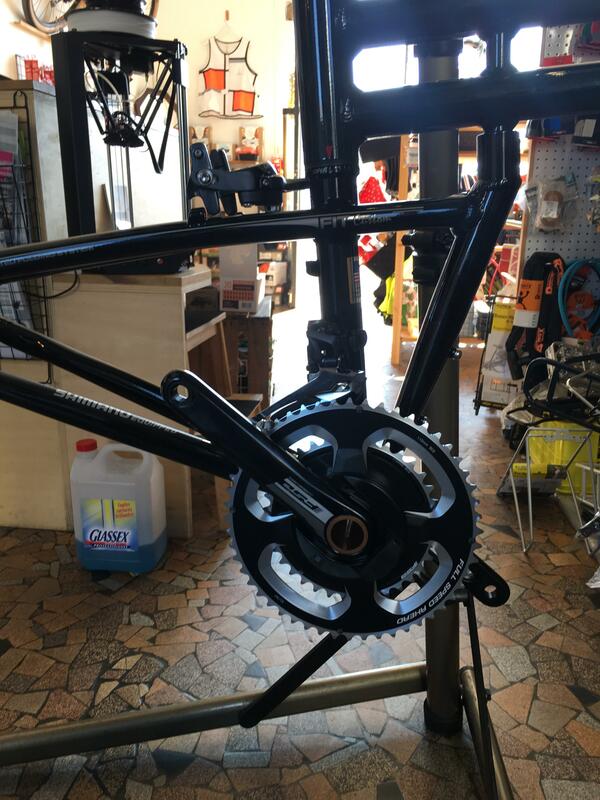 When sourcing the parts for this project, I hesitated to purchase the appropriate tools to install the bottom bracket, crankset, and headset myself. 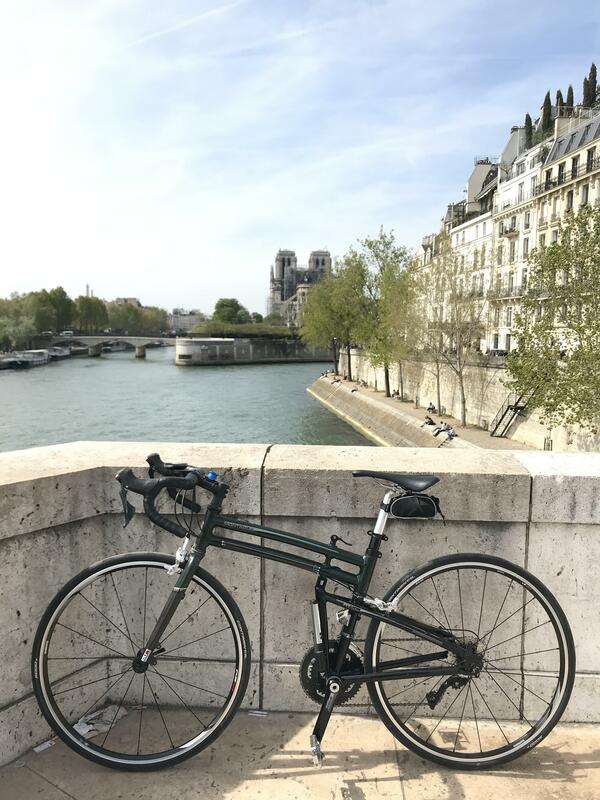 However, I thought it would be better to put those funds towards paying for the bike to be professionally built by a local bike shop, L’Atelier Poupoupido https://lepoupoupidou.fr. The following images show the installation of the headset, crank, and brakes! 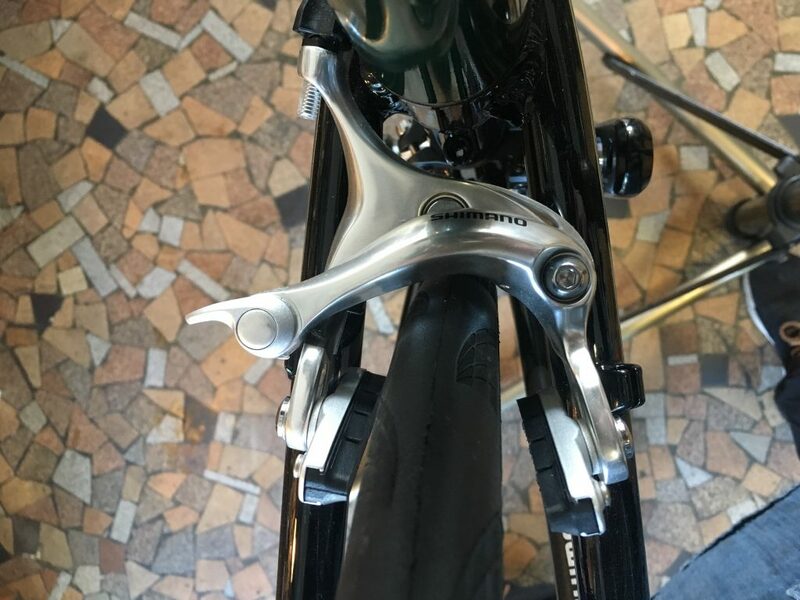 It turns out the the Ultegra brakes (with a reach of 49mm) from my Trek Madone are too short (see image below). In fact this is normal, and my error. To support larger tires, the Montague Custom FIT frame uses both rim and disk brakes. However, the rim brakes supported use a reach of 57mm. 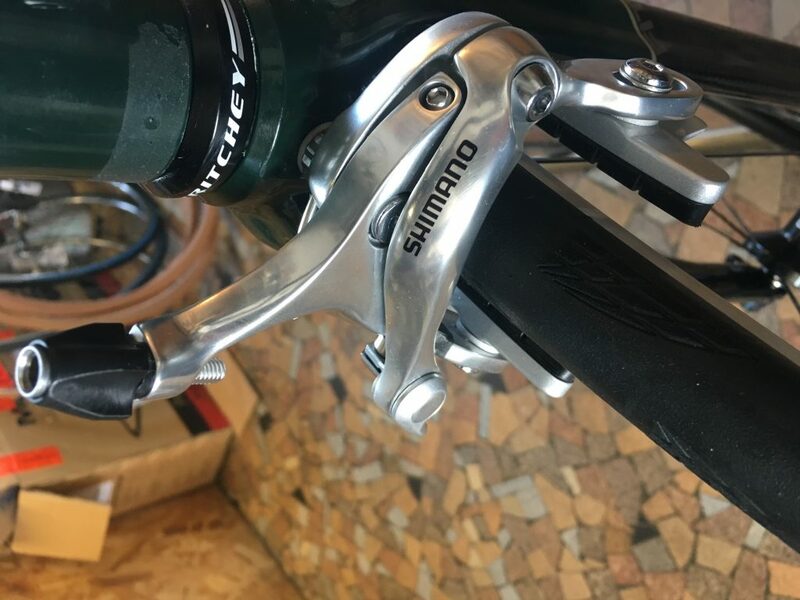 Shimano make the BR-650 brakeset, which has a reach of the required 57mm. The Shimano BR-650 are manufactured using the Ultegra series mechanics, with the silver finish of the Shimano 105 series. Brake Levers and Gear Shifters Cabling Installation – Bike taking form ! Normally the bike was planned to be ready. However, at this stage we realized that the folding frame requires a front derailleur where the cable pulls from the top. The front derailleur that I had ordered (used by the majority of road bikes) has the standard ‘bottom pull’ cable configuration. 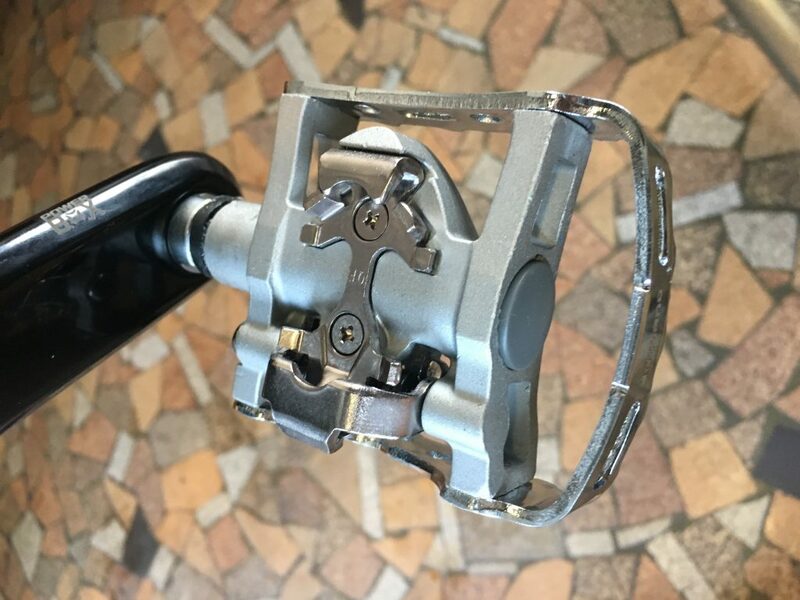 To resolve this problem it’s either possible to install a pulley below the front derailleur to re-route the cable up into the front derailleur, or purchase a ‘top pull’ front derailleur. Weighing in 10.65 kg, the bike is ready to roll. 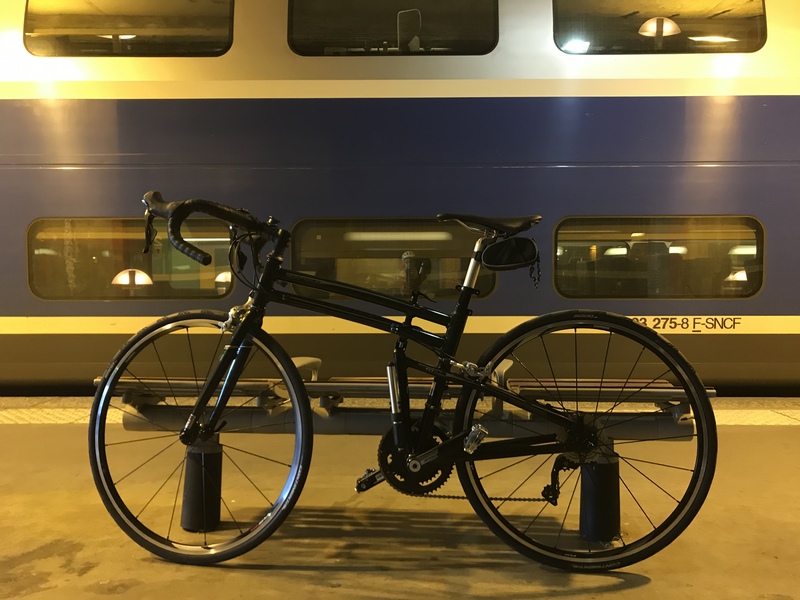 Arrival at Paris Montparnasse, the Montague Custom FIT road bike is ready for the road.